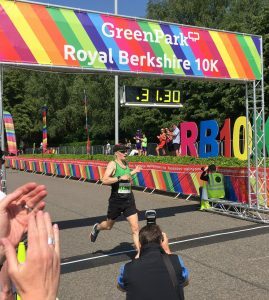 ROB CORNEY smashed his third Reading Roadrunners record in the space of just eight days when he won the Royal Berkshire 10k at Green Park. Rob’s time of 31 minutes 30 seconds took eight seconds off the previous club best which had stood for 23 years. And it followed new records in the Marlow 5 on the previous Sunday and in the Track 5k barely 40 hours before. His time of 15:23 in the Friday night handicap event improved Mark Worringham’s old record by 15 seconds… but was not his biggest moment of the week at Palmer Park. Just 48 hours before, Rob had so impressed national coach Nick Anderson that he invited our man to take part in an England training camp later this summer. 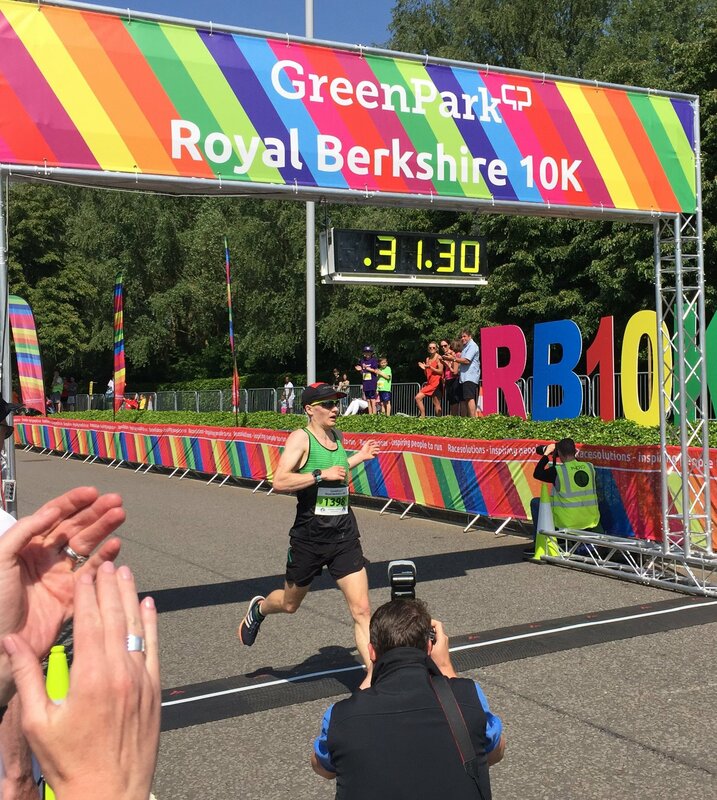 At Green Park, Rob says he “got lucky” in finding someone to push him to a new course record in the race in which he was pipped on the dip by Oxford’s Jon Holmans in a photo finish last year. That someone was the Wiltshire champion Simon Nott, who led the Roadrunners star for the first 7k. “I was definitely dragged round,” said Rob. “It was a bit off a shock to find myself sitting behind someone at 31:30 pace. Nott chased him all the way to the line, finishing just nine seconds in arrears. Another West Countryman, Dan Mapp, was third, with Jack Gregory, the winner of this event in 2014, in fourth. Afterwards Jack (right, No.2342) revealed that he has left Reading AC and joined Roadrunners as a first-claimer. That’s a great signing, as he has a 10k PB even quicker than the all-conquering Corney! Reading AC speedster, Naomi Mitchell, was first lady finisher in 36:59. 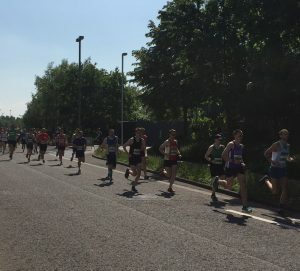 These were the stars of a race which attracted 60 Roadrunners on a baking hot day, far more than the Binfield 10k (10 RR) and our club championship 10-mile event at Hook 10 (16 RR). Dave McCoy (the Irish one) finished second at Hook, Alan Freer won the MV60 award and Katherine Sergeant came in second FV40. There were no age group prizes for our club at Green Park, although my son Mark, coached by Corney, was second in the MV40 group with a big personal best. I made it a family double with a similar placing in the MV60s and Alex Harris was runner-up at MV50. Pride of place among the personal best achievements went to Sarah Richmond-De’voy, (left) who completed a full house of PBs for the year at every distance she has competed. In doing so she emulated Gemma Buley, Roadrunners’ first lady finisher in 41:48 despite running with a heavy cold. That was passed on to her by husband Chris, recovering but still not sufficiently to finish within half a minute of his wife. 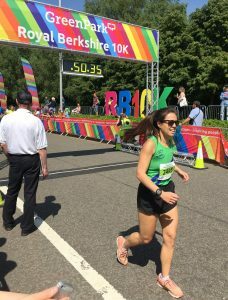 Our second girl over the line was Loretta Briggs, also with a PB to follow up her excellent performance in the Milton Keynes Marathon. 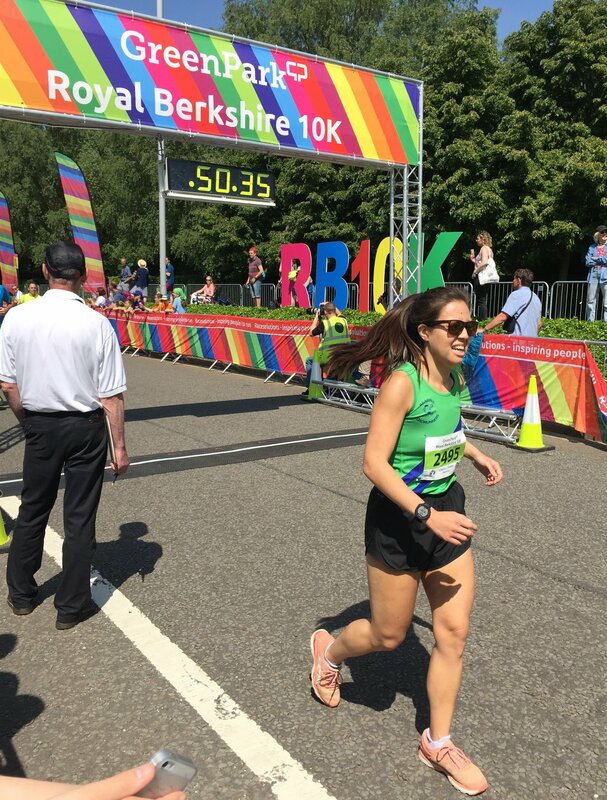 More PBs came from Beth Rudd (below), with a three-minutes improvement, David Clay, following up his first sub-20 park run the previous day, and Ivan “that was a bit toasty” Harding. Vince Williams (first time under 45), Sarah Bate, Paul Morrissey and Ben and Jess Johnson also set new marks. Rob has proved himself as a top clubman in the last month by staying behind to marshal the junior races after his victory at the Shinfield 10k and then allowing himself to be the patsy at the Track 5k. There it was convincingly proved that the only way to beat Corney is to start a race a damn long time before he does. 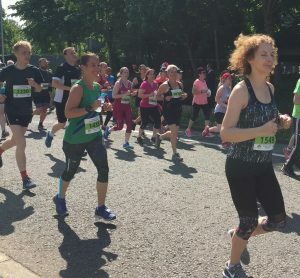 Next he will prove his worth again at the Ridgeway Relay, where he has volunteered to run leg six, the daunting climb over the Downs out of Goring, for men’s captain Phil Reay’s all-star squad. After Sunday’s latest record splurge he took the trouble to email me to pass on praise to many other club-mates who ran well and for the efforts of Glynne Jones, Emma Caswell, Chris Drew and the rest of the RR volunteers marshalling the start/finish area. Posted in April-June 18, Dibben Report, Race Reports, Roadrunners18.